Is there anything more frustrating than trying to get out of a sand trap? Mastering the bunker shot is an essential part of becoming a better golfer and lowering your scores. The fact of the matter is that you are going to hit your ball into the sand at some point or another. How you get out of the sand trap will make the difference between settling for a bogey or having a scoring opportunity. One of the reasons why bunker shots are so frustrating is because not a lot of people actually practice this shot. Many people simply pray not to land in the sand, and if they do get stuck in a trap, they grip it, rip it, and hope for the best. The intent of this page is to help you become more comfortable with hitting out of a golf bunker and help you lower your scores. One of the key golf swing tips to help get you get out of a sand trap is that you are not trying to hit the ball, you are trying to hit the sand about one inch behind the ball. This way, the loft of the club helps push the sand up and pop the ball out of the bunker. The main golf rule to remember once you are in the sand is that your club is not allowed to touch the sand during address. For practice purposes, sometimes its helpful to draw a line in the sand behind the ball where you intend to make first contact. Just don't try that during a round or you will be penalized! Once you are in the sand, the first step is to open up your stance so that your body faces the target. The ball should be lined up towards your lead foot. Having the ball further up in your stance will allow you to take full advantage of the loft of your club in order to get it into the air. I've seen many golfers with the ball further back in their stance and they end up chopping at the ball. Much of the time, this results in them being unable to get the ball out with only one shot! Not a requirement, but it is also not a bad idea to open up the club face in order to get more lift out of the sand. Going hand and hand with your open stance is weight distribution. Just like with chipping and pitching, the majority of your weight should be kept over your left foot. And when I say kept, I mean from stance all the way though your swing. This placement, combined with an open stance, will lead to a full follow through and higher bunker shots. You also do not need to swing with full force when hitting out of a golf bunker. Swing slightly slower than normal, and again, aiming behind the actual ball. The further behind the ball that you strike, the more sand that you will encounter and the ball will travel a shorter distance. Hitting out of a fairway bunker is actually not as difficult as it may seem (assuming the ball isn't completely plugged). 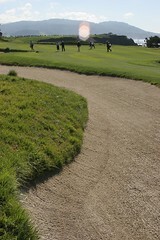 With this golf shot, however, you are trying to hit the ball squarely and take up as little sand as possible. The main aspects that are different that a traditional sand trap shot are the stance and the club face. Assume your normal stance, with feet aligned along the target line. Also, you do not need to utilize an open club face because, unless you are plugged, you are trying to obtain some distance with this shot. You want to club down 1 or 2 clubs to ensure that you get proper distance out of the shot because you likely won't be swinging with 100% power. Also, in the instance where you do take up some sand, a longer club will help make up for any loss of distance. Next, to promote hitting as little sand as possible, keep your entire lower body rigid and dig your feet into the sand. This will prevent your body from dipping and accidentally taking a large chunk of sand with the golf ball. I really can't stress this factor enough because it really does work! Finally, a slow and low takeaway will help you swing with a wider arc, allowing you to cleanly make contact with the ball and, hopefully, little else. Hopefully by following these few simple tips and taking lots of practice, hitting a bunker shot won't be nearly as intimidating as it used to be!